There are several reasons why properly installed roof ventilation are critical to to roof performance. An effective Roof Ventilation System lowers heat build up in the summer and may also reduce the risk of ice dams in the winter. 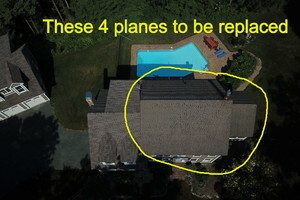 Heat build up under the roof in the summer may cause premature deterioration of your roof shingles. Warm air rising from your home that cannot vent property may lead to melting and freezing on your roof, which leads to ice dams. Temperatures exceeding 110 or 120 degrees in the attic space would be considered excessive heat. There may be steps to lower this temperature. Frost or ice on the plywood sheathing, rafters or nails shows that warm air is getting cold and freezing. Mold growth indicates changing temperatures which condenses air. Water dripping from the exposed nail tips is not necessarily due to a roof leak. Take a look in your attic. Do any of these things apply? It's quite possible there are steps we can help you take to improve your ventilation issue. Starting with a roof and attic evaluation we can very likely make some suggestions to help preserve your roof and home with better roof ventilation. We offer Free Roofing Estimates and provide high quality Roof Ventilation Services in CT. I would like to talk about Roofing Ventilation project.